After a grueling month of labor, Brillig and her crew are ready to set out and see some of the Philippines before we next have to renew our visas, which is about a month away. I am still waiting on some paperwork from the States, so we won't venture too far, just doing some shakedown cruising for Brillig to test her sailing and systems. She's looking great, but it is the wind and sea that bring out the caliber of a ship. From here we will sail east about twenty miles to the Comotes and spend a little time relaxing and tidying up little jobs—there are plenty of them. If we get no news on my mail we will either stay there or sail south to Siguiour Island and Negros, though this would be best done with all documents in hand so as to not have to return again. I have had my fill of smoke and trash and crowded jeep-mis. There has been plenty of fun I will miss some good friends. Zeke and his wife Roxane have been great to me and BOTH of my boats. And YES, Araby did sell. And to a great guy who is excited to do some good Philippine cruising with her. Anne, April, and Mira will be hard to leave. And then the good cruisers here have been good fun, of course. But I am yearning to sail and finally those days are at hand. Hopefully there will be a little peace in them as I am a bit drained from a good month (or two) of work. I will write again when I arrive in Negros. I will clear customs there in Durmagette and send a line as to my plans. Hope all is well with you. My best to all of you. I made it to Cebu Phillipines safely. The trip ended up taking about 45 hours after delays in the airport and 3rd world public transportation. Jeepmis: tricked out buses of all shapes and sizes, you just stand in the street and yell the name of your destination or somewhere beyond your destination. There is ALWAYS room to squeeze more people on. The population density on the islands with major cities is a little overwhelming. There are 7,000 islands here. The other form of transportation I used to get to the boat is the amazing Hubblehubble, a 4 stroke bike with a little chariot attached to the side. 3 passengers on the bike itself, not including the driver, 5 people in the chariot. The people are seemingly really nice. Basketball, shooting pool under a grass roof, prostitution are all popular pastimes. The toilets are in little outhouses of shotty, termite-eaten planks out over the water. I almost fell in one already. Trash disposal is, well. . . I asked where the trash was here at the marina and was directed to the largest pile. Its disgusting. The language is interesting, a lot of Spanish mixed in. The people don't know which of it is Spanish. Ha Ha,. I do. The boat, Brillig, is a very seaworthy built boat. She was just bought and needs a lot of work. All we need to do here on this particular island is to get water (no easy task), mount the self steering gear which is mostly ready just have to find a place to weld a piece on. The chain locker drains into the main bilge through storage in the v birth, so I want bed a fitting in the bulkhead where the drain is and run a hose to bypass this soon to be dry(if there is a such thing) storage space. Replace the lifelines. Everything moves and happens about a quarter the speed of there. Next I believe we will sail to Sigihou. It's only a day and half sail to Sigihou. Sigihou is 12x5 miles big and famous among locals for its witchcraft and healers. The water there is clear and beautiful, excellent diving and fishing. I can have a good look at the bottom paint and propeller. We plan on getting the charts and pilot charts out in the next couple of days, so we can think about a deadline for our departure. Moving into a new boat is a formidable job, but it is insanely pleasurable. Annabelle and I somehow keep finding new ideas and options for space and arrangement. We are beginning the stage of throwing things overboard (instead of bringing things aboard as we have been doing). We have a few significant jobs we are prepping for: mounting the windvane, liferaft, and working on the port-side settee and chain locker. I can see, barely, the light at the end of the tunnel. . . and the glistening ocean beyond. Ye-ha. Thanks so much for the updates. I enjoyed them so much. I miss being apart of the world of my friends. Thank you. I haven't written an email in an awfully long time. I haven't had much to say of interest for a while, but more recently I have been intentionally mum on a few subjects, as to not jinx myself. (I don't think of myself as superstitious, but. . . ) Now at least, all is underway. So much is changing. This is the brief of what's been going on. The first thing I wanted to do upon arrival was improve my diet. . . I know, I know: Boring. . . but NOT so. My skin was really bothering me before I left and nothing was helping. My doctor had the nerve to say that diet has nothing to do with dry skin. Yea right… So shortly after arriving back to Araby I took refined sugar off the menu. And WHAM!. ..my scalp is clean. . . I don't even use any drugs any more. It all has faded away. Not gone. Nothing is perfect, but 80% plus improvement is nothing to huff at. Sugar is foul. I am convinced. There is plenty of evidence to support my case. If interested, read "Sugar Blues"—amazingly easy to read. I read it in one sitting. A good history of nutrition. So I've been feeling good. This is key. I wasn't feeling so great for a while there. With health comes productivity. I've been getting a lot done. I cleaned Araby from stem to stern. Threw away amazing amounts of junk. Put her against the wall and painted her bottom. Won separate wars, first against ants, later against roaches. Painting her deck now, which will look really nice; her decks have been bad for a while now. I disassembled both the windvane and the heater to clean rust and inspect and clean all parts. Did a partial rebuild of the Honda generator. Lots of re-organization. The real news, however is that I have bought a new boat. The boat, a Pacific Seacraft Mariah, was sitting quietly in the yard when I returned to Araby. The Mariah has long been one of my two dream boats, but strangely, I didn't actually know that much about her. As I stared at her one day a Filippino friend told me she was for sale. Then, at the local cantina I saw a flyer with her specs and contact info. Zeke told me that she would sell easily, and she was really cheap. But looked great and stout. So I contacted the owner and started talking. His name is Jonathan and we talked everyday and I became more and more sure of what I was so afraid to do. As the dialogue progressed, I quickly became infatuated, then straight possessed by the prospect of the new boat. I could imagine it so easily; it was coming together. And then Jonathan had second thoughts about selling. He had been planning a cruise with his (Filippina) girlfriend in only two months. Then I feared I might not get the boat at all. In the end we worked it all out and I bought the boat. We shook hands on it on Feb. 23rd. He lives in Guam and was able to get some time off to come to Cebu and spend time with the boat and help me get acquainted. (His girlfriend lives here, which is good motivation.) He is a shipwright in Guam and has done fine work on the boat. The boat is small. Overall it is about the same length as Araby. But her design is in complete opposition. Where Araby is fine lined, narrow, lots of overhang, light, and fairly quick; the Mariah is round, fat, heavy, and slow. She is a turtle, but. . . she has a fat shell. Her fiberglass is about an inch thick. . . which is great if you don't know. She has a cutter rig, which, if you don't know, means two forestays and three backstays. . . which is great. She has a try'sle, which I love. I am bringing my liferaft with me as well as my Dickenson heater and windvane. She has a single-side band radio (SSB), wind generator, EPIRB, chart plotter. . . She's got a beautiful hard dinghy. Oh man, am I excited to row a hard dinghy for a change. . . and great mounting blocks on the foredeck to stow her securely. She has a brand new bowsprit, which everyone will think is pretty. She has classic, rugged lines. She's very "shippy": lots of bronze and over-sized gear. She looks like a Westsail 32 if that means anything, not so beamy. The Westsail 32 was the sailboat in The Perfect Storm, where the skipper was forced off his boat by his crew setting off his EPIRB. That vessel weathered the storm alone. They are stout boats. AND, get this. . . she has AN ENGINE!!! A 20 hp Yanmar. . . which is great. It purrs and has been so well cared for. I figured everyone would be excited about that, so few purists out there these days. Shame…shame. My engineless days seem to be over. I almost miss them. But not quite. One other element of my sailing days that is on hold for a period is my soloing. Believe it or not, I actually have CREW! Maybe it is more amazing to me than to you, but I have harbored the notion that perhaps I was always destined to sail around alone. But when I was trying to deliver the yacht from Miami I asked my friend Annabelle if she wanted to come on and crew with me. She said Thanks. I can't because I am getting my captain's license. Maybe in a few months. Well, then that boat fell through and I was gearing up to get back to the Philippines and Annabelle and I had stayed in touch. She finished her course and had nothing planned. I presented a strong case for the South Pacific and New Zealand (where we met) and the court swung to my favor. I have moved onto my new Mariah. I have re-christened her s/v Brillig. (I'll talk about the name at some other point.) Jonathan has come over each morning for coffee and spent a few hours in the lockers familiarizing me with the ship's systems. He is a harbor pilot as well as a shipwright and I have learned a good deal from him already. Annabelle arrived a few days ago. We have been in and out of every compartment moving Araby's gear aboard and finding suitable homes for everything. We still have loads to do, but we are getting so much done. Actually it's been such fun that we are half-forcing ourselves to take this half-day off to write and go to town. We have some serious jobs ahead: mounting the windvane, a chainlocker job, and then most jobs we can take with us and do as we travel. The real issue is Araby. I need to find a buyer as soon as possible. The longer she sits the more care she will need, the more moorage I must pay, the less attractive she will be. Currently, she looks great. It is funny having my TWO boats side-tied to each other. This is where I am. I'm rowing with the stream and the water is fine at the moment. The skies are clear and the horizon beckons. 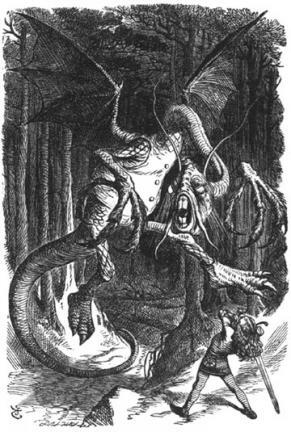 and shun The frumious Bandersnatch!" My friend Brian and I used to use the term "Brillig" to denote "coffee time" on the VHF. There are a few pictures on the blog.